The L.A. County sheriff wants to release the names of 300 deputies with histories of misconduct. He can’t. 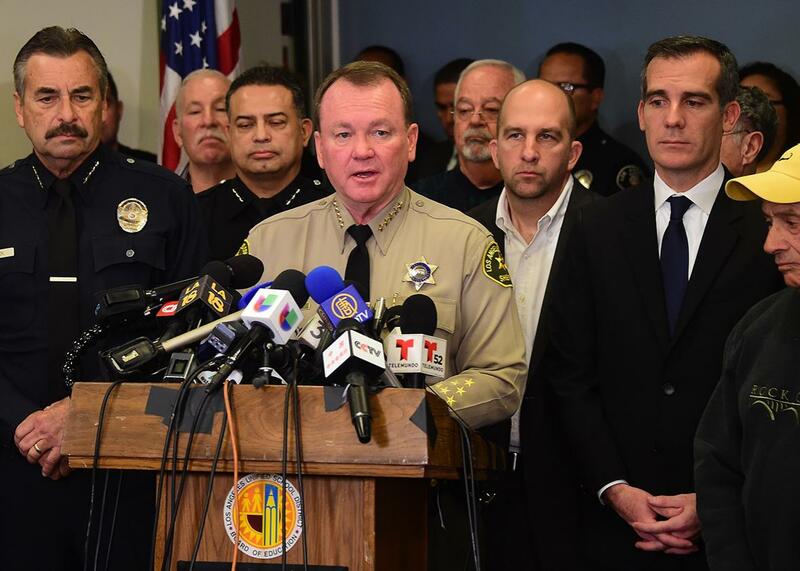 Los Angeles County Sheriff Jim McDonnell addresses the media on Dec. 15, 2015, at the Los Angeles Unified School District headquarters. Right now, Los Angeles County Sheriff Jim McDonnell has in his possession a list of about 300 deputies who have been guilty of “moral turpitude.” According to a letter the Sheriff’s Department sent to these deputies last year, the “performance deficiencies” that fall under that banner include tampering with evidence, making false statements, and using unreasonable force. These are the sorts of activities that might reasonably get a deputy fired, and they are certainly things that criminal defendants facing these officers in a courtroom have a right to know. To his credit, Sheriff McDonnell wants to share the names of these deputies with prosecutors. Handing this list to the Los Angeles District Attorney’s Office would be a significant act under the law, as prosecutors are bound to disclose verified bad behavior by police to criminal defendants. It would also be significant culturally, given that McDonnell’s predecessor Lee Baca pleaded guilty last year to lying to the FBI. The entire department also reached a settlement agreement with the Department of Justice in 2015 due to “a pattern or practice of inadequate mental health care and excessive force” in Los Angeles County jails. Releasing this list of deputies might not be possible, though. The Association for Los Angeles Deputy Sheriffs, a union that represents the department’s nearly 10,000 working deputies, has filed a lawsuit arguing that McDonnell does not have the right to turn over the list under California law, which shields law enforcement personnel files more strictly than almost any other state. A California appellate court agreed. The parties to the lawsuit are now waiting to see whether the California Supreme Court will weigh in on the case. Information about a law enforcement officer’s history of bad behavior falls under a set of obligations called the “Brady rule.” It’s probably the most misunderstood law in criminal proceedings. In addition, the police—acting as an arm of the DA’s office—are trained and held responsible for upholding the Brady rule. In a 1995 case, Kyles v. Whitley, the Supreme Court clarified that prosecutors were responsible for handing over information obtained by police investigators even if the officers never gave that evidence to the DA’s office. The opinion asserted that prosecutors could establish “policies and procedures” to ensure that evidence was found and produced. Since then, officers have been on notice that Brady material is their responsibility. An expert in law enforcement told me that any officer who claimed not to know Brady was too incompetent to do her job. In the end, a prosecutor’s disclosure is only as valuable as the underlying information in that disclosure. And there’s the rub. If a cop has been subject to discipline but the prosecutor doesn’t know about it, there’s no real motivation for anyone to disclose that information. As part of the pending lawsuit on the release of the Los Angeles deputies’ names, a deputy district attorney revealed in a declaration that the office “does not have a practice or policy of independently requesting or soliciting from any local police agency potential Brady material or information from any peace officer’s personnel file.” In other words, the Los Angeles District Attorney’s Office does not search for—or even inquire about—police personnel files. Why? Because they would then have to notify the defense. On March 1, in response to the lawsuit, District Attorney Jackie Lacey announced changes to the office’s Brady disclosure rules. Those changes require policing agencies to inform the Los Angeles DA’s Office about officer arrests and convictions but not about other accusations. (The old policy required no disclosures of any kind.) Under these new rules, police agencies still won’t be required to send the DA’s office information about officers that have been found to have committed substantial misconduct via internal investigations or other nonpublic hearings. In California, strict disclosure rules have kept the content of law enforcement personnel files hidden. The names of officers involved in internal investigations are not released; even prosecutors require a court order to see them. State courts generally won’t permit the disclosure of such files even when there’s a relevant lawsuit. Right now, the Los Angeles DA’s Office finds out about “bad cops” basically by word of mouth. Defense attorneys can only make a motion for the judge to review the personnel file and determine if it contains anything relevant. For the Los Angeles Sheriff’s Department—the largest sheriff’s department in the country—the disclosure of wrongdoing is of vital importance. Under Lee Baca, the Los Angeles County jails were not only inhumane and cruel. Baca and his deputies also intentionally blocked FBI personnel who were investigating the jail’s conditions. As a result, the department has a long way to go to restore public trust. Sheriff McDonnell’s effort to improve transparency was just one of many necessary moves. The Association for Los Angeles Deputy Sheriffs has its own motives. Deputies who break rules can be subject to disciplinary actions, resulting in demotions, the loss of their jobs, or the loss of pensions. Their anti-disclosure argument hinges, essentially, on a belief that an officer’s right to have his history protected is more important than a defendant’s right to a fair trial. It’s easy to blame the union for its stalwart protection of law enforcement employees even when they have done wrong. But it wouldn’t be in this position of power without the support of politicians, lobbyists, and elected officials, including district attorneys. Prosecutors are responsible for bringing justice to the whole community, and that includes informing defendants when officers aren’t up to snuff.